A long time and highly respected city employee by the name of Ray Harden passed away on November 1, 2008. The day he was buried in the St. John’s cemetery of Clay County was like coming full circle once more. It was in the St. John community that he found the love of his life and his faithful companion, a very pretty young girl by the name of Tessie Thrasher. After they married, it was Tessie who stayed by his side and tenderly cared for him any time he was sick, and especially so during his last illness. A monument bearing both their names was recently placed on his grave. Included in the information on that monument was an inscription suggested by a family friend, Mrs. Della Harvey, that says: "To know them was to love them." Everyone who is only slightly acquainted with either Tessie or Ray will agree wholeheartedly with that phrase. They are both at the top of the list of what I call "the gentle people of the earth." Here is a look back at their early years. Ray Harden came from a family of four children, three boys and one girl whose names were Elbert, W.J. and Lana. His parents were Harrison Harden and wife Lillie Stanford Harden. The Harden family made their home in the Lilly Dale community. 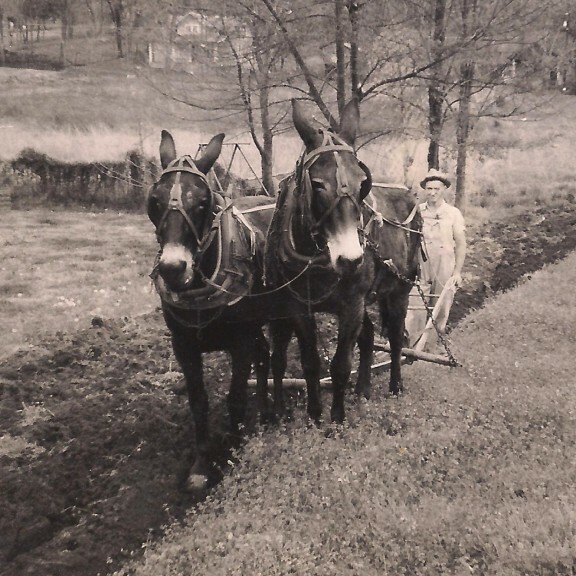 At a very early age, Ray carried the mail on horseback, and would sometimes haul mail in a wagon pulled by a team of mules. Sometimes when he rode in a wagon on the mail route, and the weather was cold, he heated bricks, placed them in a tub, and covered the bricks with hot coals and ashes to help keep his feet warm while delivering the mail. He went to school at Lily Dale through the eighth grade, and even went back an extra year just to be in the eighth grade one more time. The Harden family lived near the banks of the Obey River in the Lilly Dale community, and experienced their home being flooded on several occasions. The river got up high enough during one of these floods that a pot of beans sitting on the wood burning kitchen stove floated off and ended up sitting on the kitchen table when the water went down. On another occasion, Harrison Harden checked on the damage to their home during a flood by paddling around inside the house in a canoe. Ray and Tessie met at a neighbor’s home where a dance was being held. Ray not only danced on these occasions, but called sets at these dances. Folks who held dances in their homes moved out as much furniture as possible from the front room or even a bedroom to make room for the dancers and musicians. Ray asked Tessie, who was only fourteen years old at the time, to dance with him that night, and that was the beginning of a four year courtship. Tessie’s parents made their home in the St. John community near Willow Grove. They were Burr Thrasher and wife Venice Colson Thrasher. Tessie’s father was a mail carrier and farmer. There were eight children in the Thrasher family, four boys and four girls. The names in the order of their births are: Lucille; Tessie; Doyle (who was killed in World War II); Willie, who was known by the nickname "Scrutcher"; Juanita; Elise, Randall; and Eddie Ray. The Thrasher children attended school at the St. John, a one room school not too far from their home. Two of the teachers Tessie remembers having there were Chester Ledbetter and Nan Sewell. In the later years of this school, an additional room was added on for the smaller children. Pie suppers and spelling bees were always well attended events at St. John school. After completing the eighth grade at St. John, Tessie went on begin high school at Willow Grove, but dropped out because she didn’t like it. She found work in one of the homes there in Willow Grove through a government program that employed women in that area. In this particular home, mattresses were made. A lady by the name of Myrtle Capley oversaw the fifteen or twenty women who made the mattresses. Some of the women even took their work home with them and were supplied with the patterns and materials to complete the job at home. After two years on this job, Tessie found another job as a cook at the St. John school. She, along with Claudine Ledbetter Sells, did all the cooking of school lunches for the 50 to 60 children who attended school at St. John then. 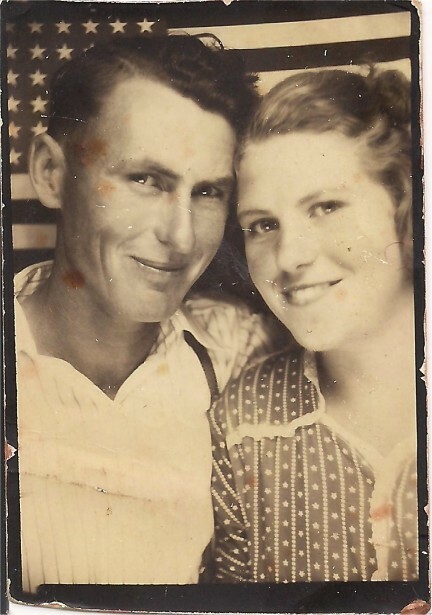 Ray and Tessie were in the early days of their courtship when this photograph was taken while attending the Clay County Fair one year. During the years Ray and Tessie were courting, Ray would walk from his home at Lily Dale to go to church with Tessie and her family at the St. John Church of Christ which was also the place school was held. Tessie was cooking at the school on the day Ray came to get her so they could run off to get married. That was on November 14, 1941. Tessie was 19 and Ray was 29, and with the help of Ray’s uncle Sidney Stanford, they traveled to the courthouse in Celina where they were married by a county official named Willie Hunter. The young couple moved in with his parents for a few months prior to their moving to Livingston to live. Upon learning that his daughter had gotten married, Tessie father made the statement, "There goes my good work hand." Tessie recalls how the families would load into wagons to go to "meetin" at churches on the other side of the Obey River from Lily Dale. She especially remembers how scary it was to cross the river after dark and go up the steep bank on the other side. This was prior to the bridge being built at Lily Dale, a job Ray helped with. The road on the other side of the river could be traveled to either Byrdstown, Tennessee, or Tompkinsville, Kentucky. Tessie Thrasher Harden stands on the Lily Dale bridge to have her picture taken. For a period of time, Ray had a job with the construction of Dale Hollow dam. After moving to Livingston, he and Tessie rented a house not very far from the property they later bought located on West Seventh Street in Livingston. In 1944, Ray worked as a clerk for Mr. R.D. Reed at his grocery store on Church Street. 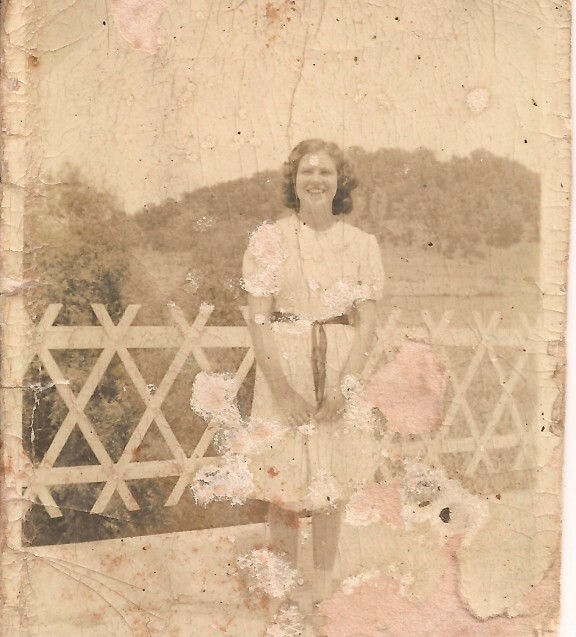 Tessie took care of their home and always made a big garden every year, and in 1945, she got a job at the shirt factory, even though the day she was hired, she just went there with a friend who was looking for work. She ended up working until the factory closed sometime in the 70's. It was while Raleigh Needham served as mayor of the Town of Livingston that he came to see Ray to ask if he would be interested in taking a job reading meters for the Town of Livingston. Raleigh had known Ray for some time, and considered him to be an honest and trustworthy person, someone he knew he could always depend on to do a good job. Ray accepted Raleigh’s offer, and worked for the Town of Livingston until he retired in 1991. Ray and Tessie lived in one of Livingston’s older homes on West Seventh Street until 1984, the year they built a new brick home nearby. Raising a big garden was always something Ray and Tessie did together. Neighbors and others who were acquainted with them would often come by during the gardening season to buy vegetables from them. Ray and Tessie have been long time members of the Allons Church of Christ where Ray taught a Bible study class. He was always well prepared for that class, and spent many hours in preparation and study each week. He was bedfast the last couple of years he lived. During that time, Tessie made it a point to always be at his side, but should he awaken to find that she had stepped out of the room for a minute or two, he would inquire of Tessie’s whereabouts. He always made the same statement when asking for Tessie. He would say, "I want to see my Tessie." If Mrs. Della Harvey happened to be there on these occasions, she would ask Ray to tell her what Tessie looked like, he would always reply: "She’s of average height; average build; the prettiest lady in the county; and she’s good too. You can’t bet her anywhere." Tessie said Ray was very easy to take care of, and that he never complained. It was quite easy to see how devoted to each other they were. The very special memories of their early years together, beginning with a time they shared their first dance, to Ray’s last days spent on earth, will be carried in Tessie’s heart forever. I’m very happy she allowed us, through this story, to share in those special times too. Ray Harden plows ground behind what was once known as the Albert Evans home. The field he was plowing was on Miller Street.